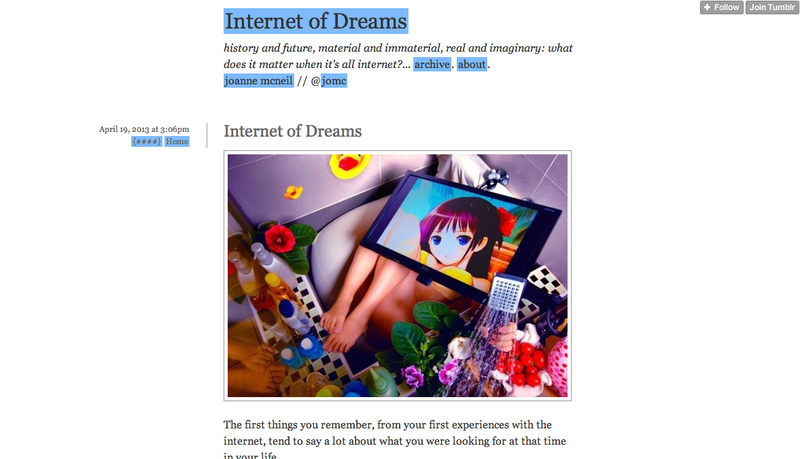 Partly a blog, partly an open notebook of research and writing on properties that are specific to the internet. The topic is broadly the slippery chasm between realities and unrealities online: Photoshop falsehoods, hoaxes, character creation, storytelling experiments in text and pictures, and network mythmaking. The internet as a shared experience of make believe and dreams. This is an expansion of some of the ideas I presented in February 2013 at NODE Forum for Digital Arts. Similar ideas and examples were presented at Stories from the New Aesthetic at the New Museum and Improving Reality at Lighthouse.